Enjoy up to S$1,000,000 total cover and 100% Emergency Evacuation. With NO Geographic limits and you can take trips of up to 90 Days. The cover includes Cancellation & Curtailment Cover. Enjoy a Low Excess of S$70. Wise Travel membership also includes Discounts To Over 100,000 Hotels, Exclusive Lifestyle Benefits and Member Only Promotions. Travel with total peace of mind starting at SG$188 pa for individuals and discounted rates for families. If you are looking for an extensive travel insurance package and want to benefit from additional travel related promotions, rewards and exclusive offers, then Wise Traveller is your best choice! With unlimited trips per year and a very generous 90-day trip limit, you are covered at all times. In fact, you are also covered across all geographic regions, including the USA! If thing does go wrong, you’ll be pleased to know that you are covered for up to S$1,000,000 total cover, which includes, S$310,000 on Medical Expenses. What’s more, as a Wise Traveller Member you will receive access to Hotel discounts, which entitles you to up to 50% off best available rate at 10’s of thousands of hotels globally subject to room availability. Not forgetting that you also gain access to Priority Pass VIP lounges and Global Roaming Discounts to help you stay connected to work and family. The Wise Traveller Membership and Travel Insurance is the perfect package for anyone who wants a global cover with little to no restrictions. 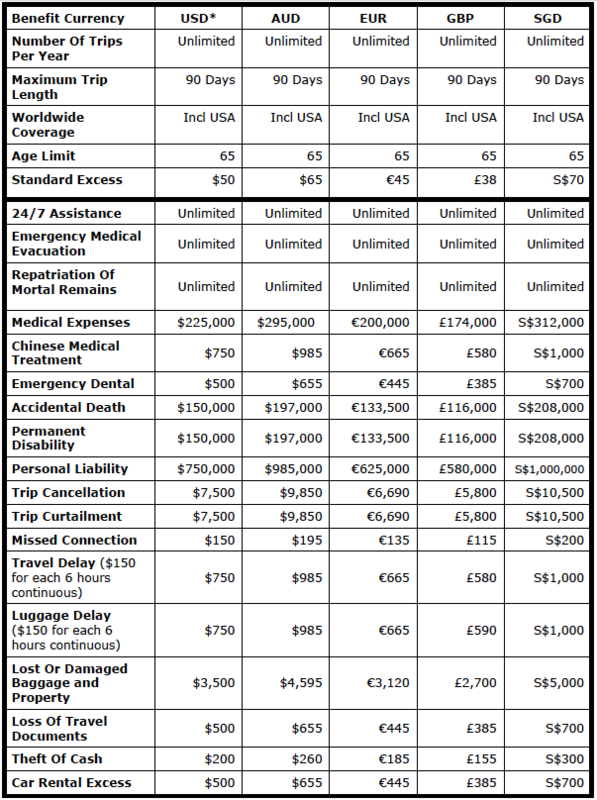 Below is a breakdown of the detailed travel insurance cover you receive across all of the Wise Traveller Packages. With Unlimited trips per year and a worldwide cover including the USA. This table reflects per trip coverage for each trip taken per membership year. The Table is for guidance purposes only and must be read in combination with the approved Policy Wording. Benefit payments will be calculated on USD value for payment. Non USD benefit levels are indicative based on exchange rates at time of publishing and may vary due to exchange rates at time of payment. 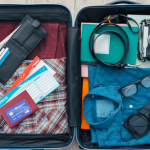 The Wise Traveller Travel Benefits and Travel Cover are underwritten by Tokio Marine Insurance Singapore Ltd and managed by Allianz Global Assistance. The Wise Traveller was created to offer leisure and business travellers an innovative, all-in-one membership programs that allow members to upgrade their travel experience through the best discounts, services, and travel amenities in one convenient package. Headquartered in Singapore, The Wise Traveller serves an international customer base through its worldwide network of agents, affiliates, and distributors. The Wise Traveller’s innovative membership products are made possible through innovative partnerships with recognised travel industry leaders. The service partners include, Allianz Global Services, Tokio Marine Insurance, Hotel Express International, Open Fairways, Priority Pass, Hertz, Avis among many others. The Wise Traveler mission is to upgrade your travel experience by staying secure, relaxed, in comfort, connected and active.